The enticing combination of chocolate, honey, and vanilla make these thumbprint cookies a melt-in-your-mouth delectably sweet sensation. Sift flour, cocoa, and salt into a small bowl. Cream butter and sugar with an electric mixer on medium-high speed until fluffy. Reduce speed to medium and add the egg yolks, cream, and vanilla extract. Scrape the sides of the bowl. Add the flour mixture and beat until just combined. Roll ball using 2 tsp dough for each. Roll the balls into the sugar in the bowl. Place 1 inch apart. With a wine bottle cork (or the handle of a wooden spoon), press gently in the center of each ball to create an indentation. Bake, rotating sheets half way through, until cookies are set, about 10 minutes. Let cool slightly on baking sheets, then transfer to wire rack to cool. Combine honey, cream, and vanilla seeds and pod in a medium saucepan over medium heat. Bring to a simmer. Cook until the honey dissolves. Remove from heat and let cool for 20 minutes. Place chocolate in a food processor. Return cream mixture to a simmer, and then strain through a fine sieve. Pour cream mixture over the chocolate and let stand for 1 minute. Process until smooth. Add butter and continue to process, scraping down sides occasionally, until butter is incorporated. Let cool for 5 minutes. 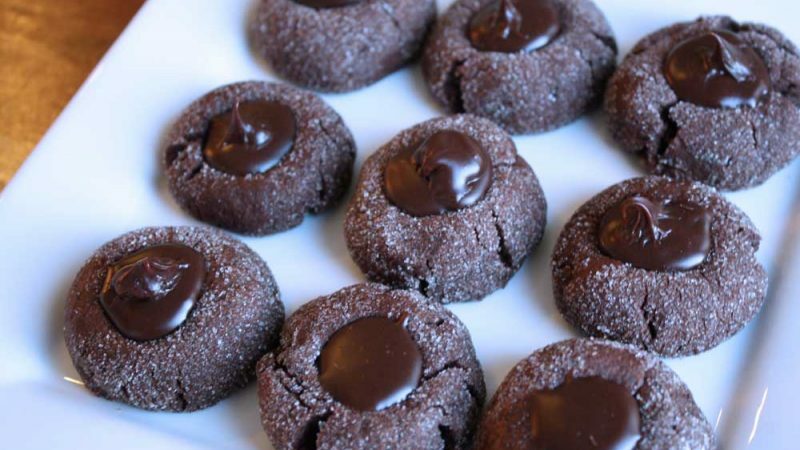 Using a spoon, or pastry bag, place a dollop of the ganache into the indent of the cookies.